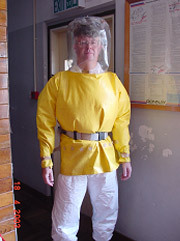 An Asbestos Management Plan was prepared for the club in 2001 that provided operational measures needed for careful monitoring and observation of ACM which was due to be removed at a later date. In 2003, prior to the renovation of the Kowloon Cricket Club, David Green completed all aspects of asbestos investigation, abatement planning, tender assessment and contractor supervision for the removal of asbestos acoustic plaster in the squash courts and trophy room. The asbestos materials identified contained ammosite and crocidolite (Type 3) and chrysotile (Types 1 and 2). The methodology involved the segregation of all effected areas of the club prior to removal under full containment and negative pressure. All asbestos was removed safely and efficiently based on an Asbestos Abatement Plan accepted by the Environmental Protection Department. The AAP complied with all relevant codes of practice to ensure the safety of the workers and the club members. The asbestos removal was completed to budget and well within the programme with daily monitoring and close contractor supervision.